Words cannot express the deep deep sorrow we feel at the news of Sarah’s tragic death. She was one of our most talented campers and grew into one of our most loved coaches. She was an inspiration to everyone. The world will be an emptier place without her positive spirit and she will be sorely missed. We send our heartfelt wishes to Rory and her family. Feel free to send us your memories so we can add them to this page. 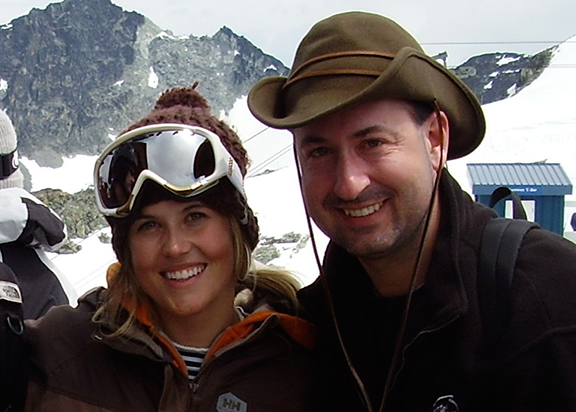 “Hi momentum, this is my memory of Sarah Burke. I’ll miss her so much this year at momentum 🙁 she was an amazing skier and truly inspirational. 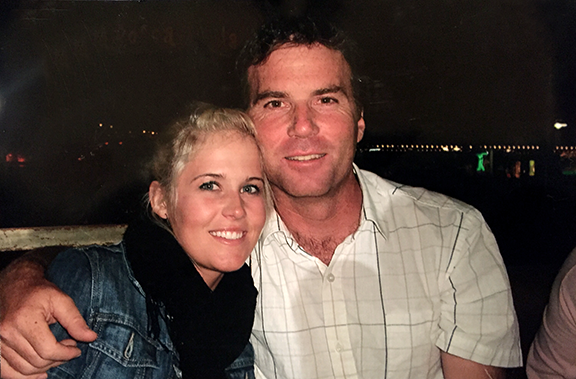 “I was extremely upset, and shocked when I heard the news about Sarah’s passing. 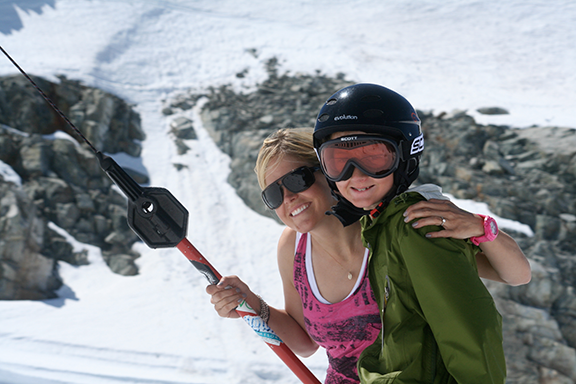 Being able to meet and ski with her at Momentum was one of the greatest experiences of my life, and I will never forget it. She was always smiling, always having fun, and always willing to help out. When I first met her, I could not believe the amount of enthusiasm, and energy she had. It was infectious. On and off the hill nothing changed. 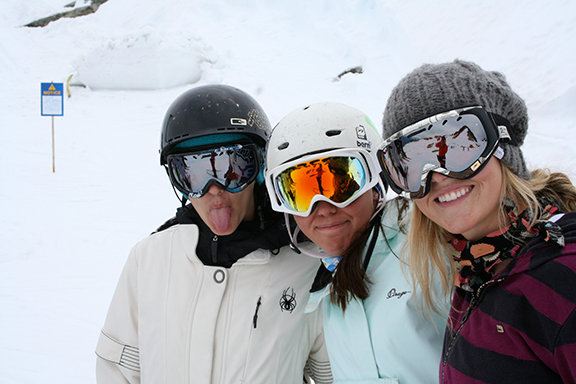 Even when the weather was bad, and people were taking it easy, she still wanted to shred as hard as any other day. Sarah wasn’t just doing her job as a coach and camp councilor. She was a mentor, a role model, and a friend. Words can not describe her inclusive attitude and engaging personality. After my second year at Momentum I went up to see the Dew Tour at Mount Snow. While watching some practice runs in the pipe I was startled to get a tap on my shoulder. When I turned around I was greeted with Sarah’s beautiful smile. 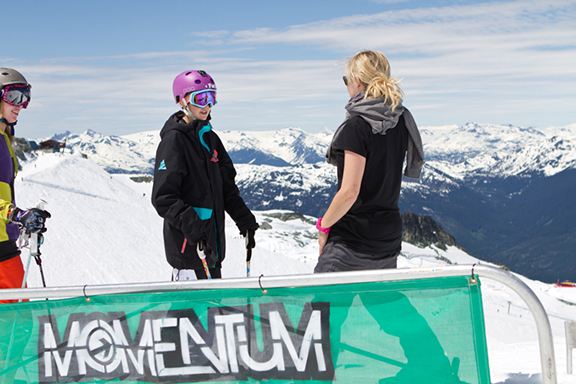 She was extremely engaging, and asked me about my ski year, how I was doing, and what new tricks I had learned. 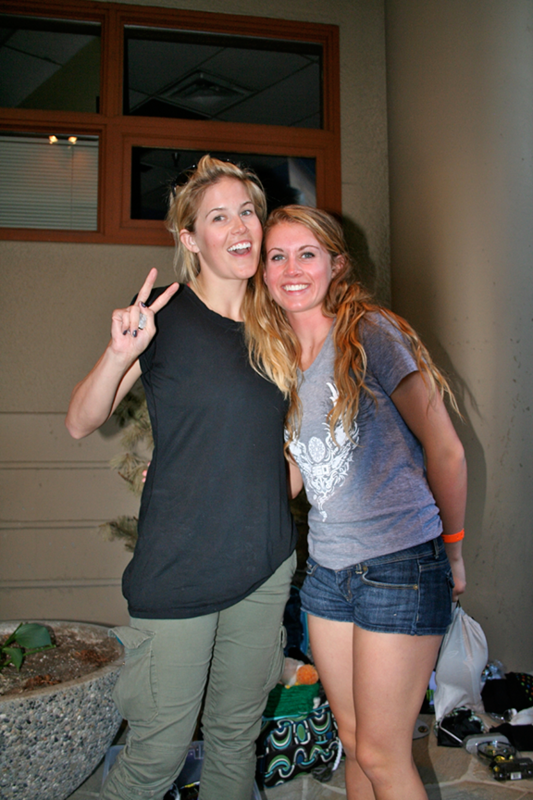 Throughout the whole weekend, whenever we ran into each other, she would take time out of her day to chat with me. It still amazes me to think of that weekend, and how genuinely enthusiastic she was about talking to one of her campers. 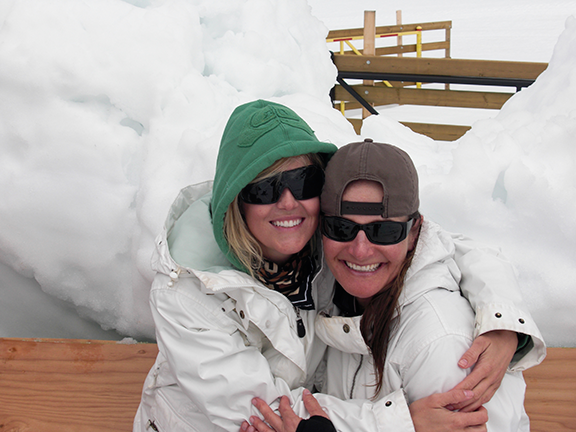 “When I first came to Momentum in 2004, Sarah was my first coach on my first day on the glacier. She greeted me with her warm smile and made me feel welcome as one lonely adult surrounded by swarms of teenagers. 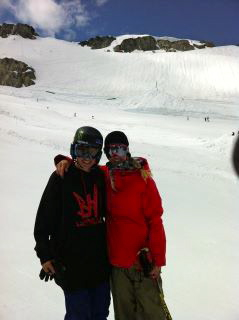 Sarah spent two full days teaching me how to ski my first rail. She watched me crash again and again, and she never stopped encouraging me and pushing me to keep trying. 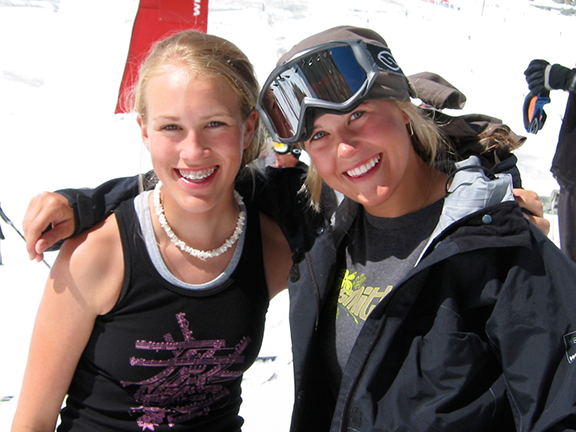 I couldn’t believe that she would spend so much time helping someone who clearly had no future in the sport, even with all of the young future pros all around her. When I cleaned the rail for the first time, I think she was more excited than I was. 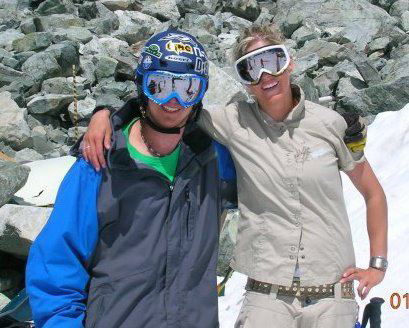 As the years passed, Sarah gave me more tips and advice each summer, but more than anything else, she was a constant positive presence, one who gentle pushed me past my comfort zone to try new tricks. I haven’t seen Sarah in a few years, but she will always be my first coach. Every one of my few meager freestyle skills is built on the foundation that she gave me in those two days on the flat bar. I can never repay her for that gift. Or for believing in me. “Dear John. Just the other day and far from the mountains, I was chatting with a colleague and the conversation turned to athletes and sports icons and I mentioned you and your glacier — a place where world class athletes have always gathered to share their love of the sport and of the snow. And I continued and described how the coaching and cajoling, praise and criticism, all produce a long line of skiers, exceptional not only for their talent and accomplishments, but for their modesty and generosity in sharing their sport. I mentioned you and then I mentioned Sarah and how she is a striking example of talent combined with modesty and how her presence and infectious smile always make one feel welcome and at ease and then my colleague told me of her passing that day – I had not heard any of the news regarding her accident and thought it odd that she would be on my mind on the day she passed. I thought of you and her friends and family and all those, including me, whose lives are better for having known Sarah. 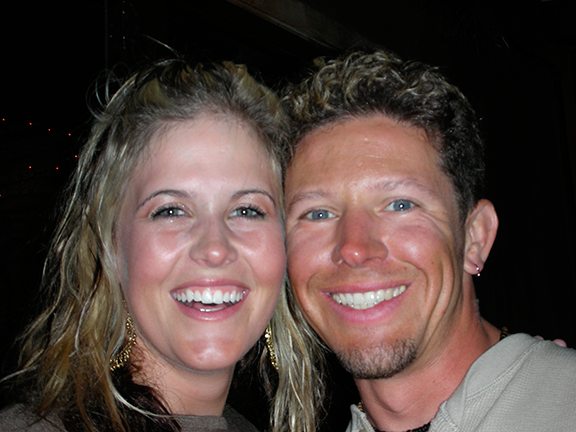 Sarah was such a fine and kind, humble and warm young person. Just as in your memories of her, in all of mine she is always smiling – a wonderful gift to have left for us. “Sarah was a hero. 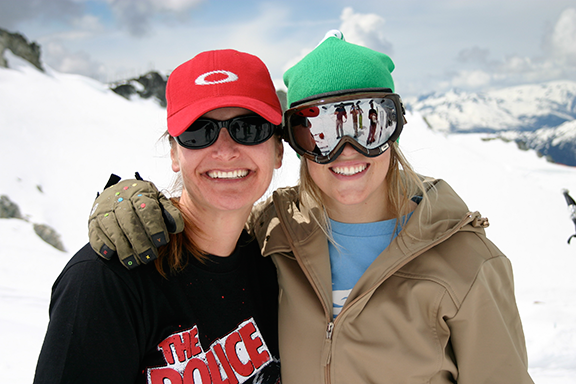 As a female skier I grew up being inspired by Sarah and attending Momentum and meeting her was such a profound honor. 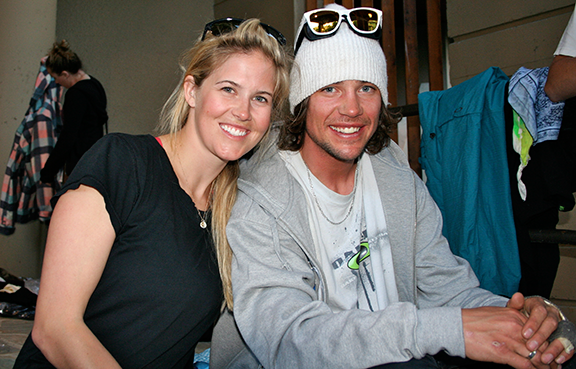 Years ago, as a 16 year-old bushy tailed mogul skier I met Sarah. This one night I snuck out of my room and decided to go out. It was a rest day the next day so I thought “why not.” I ran out through the parking garage and proceeded into the streets of Whistler. I found some other campers doing the same thing. After a while, we ran into some diggers and coaches, Sarah being one of them. She laughed at us and asked “Lily, Oli, guys, what are you doing out here? !” She laughed and joked with us for a while, walked to Pita Pit with us and the few of us turned into a little flock for the night. It was just so awesome how taken care of and how akin she made us all feel. Ha, but the next day when Sarah reported us and me and Oli were sentenced to dig for the next few days. Which is why, to this day I can build one hellava kicker and wall! Adult Campers, John and Lisa Brondello sent us a DVD full of images, here’s a nice selection as well as this tribute from John. Many Thanks! 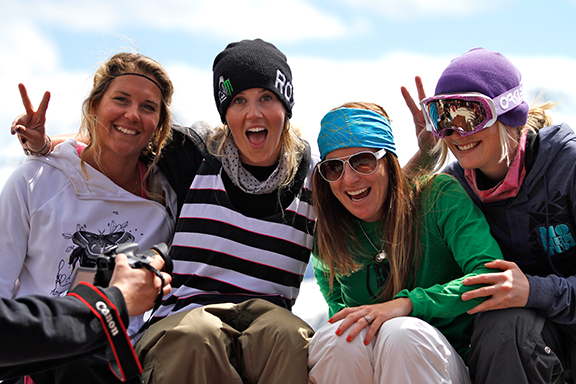 “I remember meeting Sarah Burke the first day I arrived at Momentum Camp. I remember immediately being impressed with how personal she was. In my eyes, she was an untouchable superstar. She shattered that image immediately. She was there to have fun with the rest of us. She wanted to get to know you and be your friend. I couldn’t detect a bad bone in her body. As the week went on, I was taken aback by her humility. 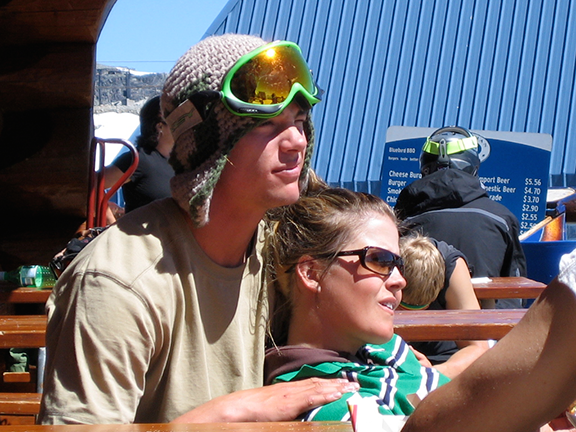 I had never ridden park before, so I was feeling quite self conscious about being in the freeride group. Sarah met me right where I was. She not only encouraged me, she praised me for every little (and I mean little) advancement that I made. It was not under her to be hanging out with beginners. 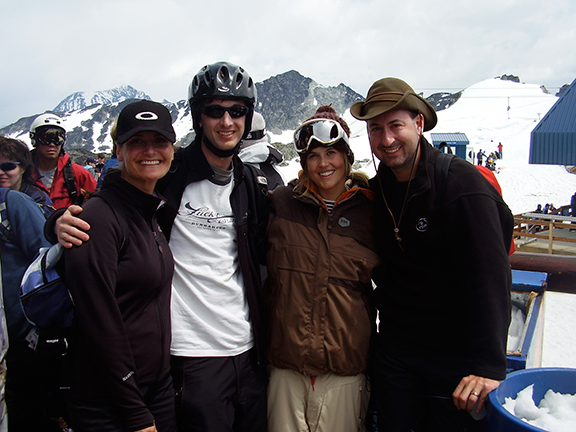 Sarah loved to see people enjoy skiing and the sport she loved so much. 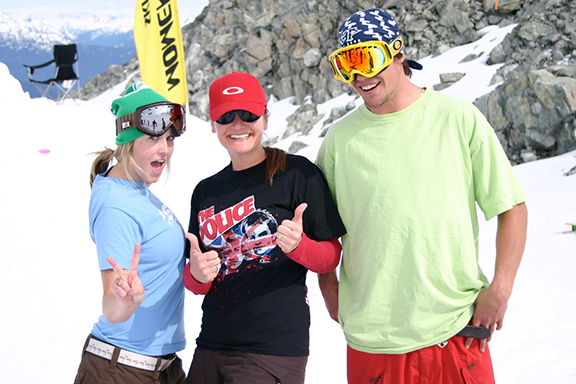 I remember at the video review one night bringing my Sarah Burke Huck Doll to have her autograph it. When I asked her to sign it, one of the other coaches exclaimed “YOU HAVE A HUCK DOLL?!! !” The coach took the doll to see it and immediately commented, “It doesn’t even look like you”. Sarah responded, nonchalantly, “I know! I will need to be more involved if they make another version”. Sarah hadn’t bragged about her accomplishments or her stardom. 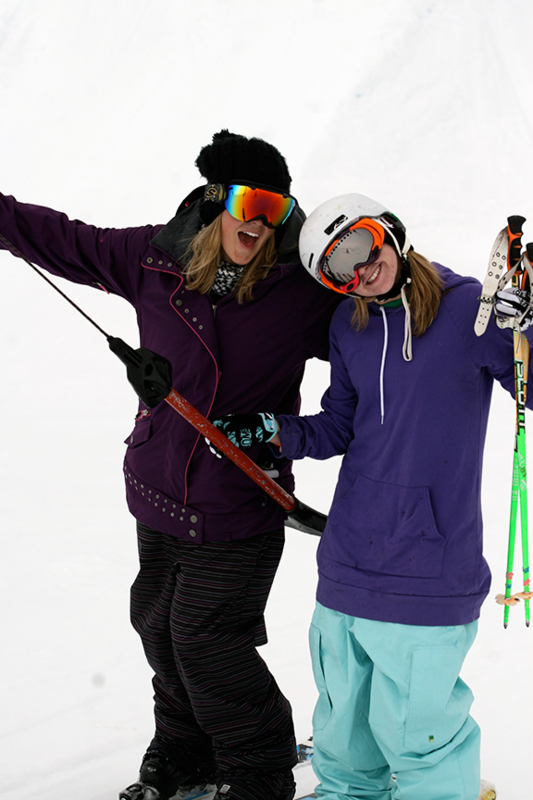 She just enjoyed being a coach and hanging out with fellow skiers. The stardom never went to her head. 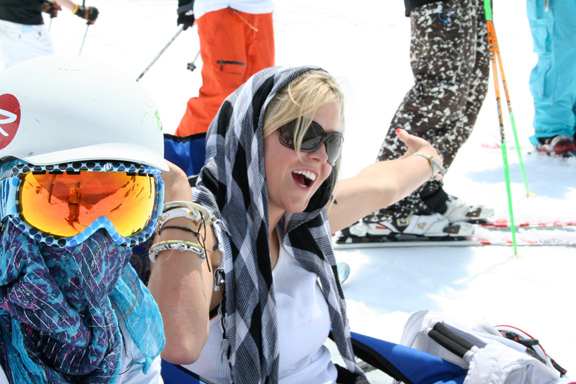 – Ski in Peace Sarah, we will always remember the joy and happiness you brought to us all!